If you need Group booking, Pls sent us E-mail in advance!!! The following group types are not accepted by this hostel: Junior / Primary School, Business Trip, Stag/Hen/Bachelor Party If you have misrepresented the type of group you are booking for, your booking may be cancelled by the hostel." Este texto foi traduzido usando Hostelworld viajantes dizem Mingtown Etour International Youth Hostel é 'no coração de Xangai, [com] lojas e lugares para sair todo o hostel', 'muito próximo ao metrô Praça do Povo e Nanjing Road, [dentro] fácil distância para Francês Concessão ". Os nossos clientes freqüentemente elogiar os quartos confortáveis, 'limpos e bem conservados ", bem como a equipe, que são" agradável, amigável e falam Inglês bem'. O bar serve 'uma boa seleção de cervejas em garrafa Europeias ». Nós gostamos de seu pátio, o que nos é dito é "um ótimo lugar para relaxar e olhar para cima nos céus '. 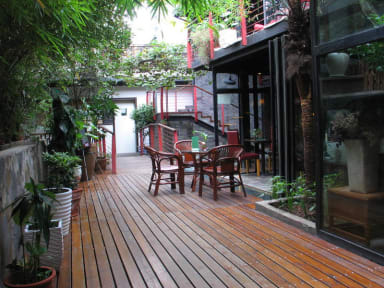 The Mingtown Etour Youth Hostel is located in the metropolitan city in China — Shanghai! It's located in the center of the city, right in the People's Square area. 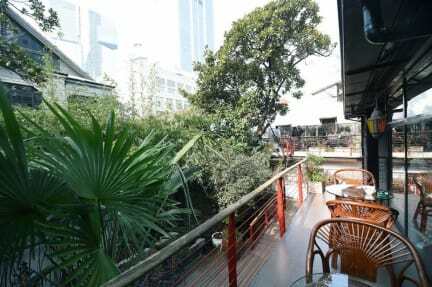 The entire hostel is built in old-fashioned Shanghai residential style, and the flat construction design distinguishes it from skyscraper hotels. It has its own central courtyard as an open area for guest activities. The building's traditional brick suits the surroundings well, and opens directly onto the cultural attractions of one of Shanghai's Nong Tang (old-style narrow alleys). The hostel holds 20 standard rooms and over 70 bunk beds. Onsite facilities include a restaurant, bar, self-service laundry, common area, as well as a mini pool. The young staff members speak moderate English, and are familiar with tourism points of interest and travel information. The hostel is also pleased to help guests with making local travel arrangements and reservations of hostels. An abundance of famous sightseeing attractions are within walking distance. Within 10 minutes walk, you can reach the Nanjing Road pedestrian shopping district, People's Square, Shanghai Museum, the office building of Shangai municipal Goverment, People's Park, Shanghai Museum of Contemporary Art (Shanghai MOCA), Madame Tussaud's Wax museum and Grand Theater. Within 30 minutes, you can visit the Xin Tian Di, the site of First Nantional Congress of Chinese Communist Party and the Bund. On special occasions, you can even watch fireworks and national holiday ceremonies right from the hostel terrace! There are 3 types of room in the hostel. Dorm room, double room(shared bathroom) and twin beds private room (private bathroom). All rooms are equipped with air conditioning and with windows. The bathroom is 24 hour hot supply. The wifi is only available in the Bar. The guests also can borrow the slippers, towels, locks, plug adapter and electric mosquito repellent heater (summer only) from the reception, and the reception provide free toilet paper too. There is also a pay telephone at the reception which can make domestic and international phone calls. The self service kitchen has a microwave oven, an electric kettle and refrigerators. We have a laundry area on the terrace. The guests can do the laundry in the sink or by the washing machines. They can get the washing dry by hanging them out or by the dryer machine. The washing machine and the dryer machine are coins operating machines. They need CNY 8.00 to start. The washing machine needs 45 min and the dryer machine needs 90 min to finish the whole process. There is also a bar/café/restaurant in the hostel which provides breakfast, pasta, pizza, fried rice… and handmade coffee with good quality and decent prices. The guests can have a discount with 20% off with the room key in the bar. Kindly notice that we have Cat in our hostel. Please inform the reception one day early if you need to check-in or check-out at other times, or it may cause NO REFUND. 2. All Children under 12 years old are not permitted in shared dorm accommodations Ã¢ï¿½ï¿½ they must be with guardians in private accommodations. All Children under 18 years old must be accompanied by legal guardian. The guests are not allowed to bring unregistered visitors into the Hostel or the Dorm Rooms!!! This can result in the guest being asked to leave the Hostel immediately with NO REFUND!!! And the visitors need to leave the hostel before 23:00. 3. The hostel doesn't provide disposable toiletries. 4. All the rooms are non-smoking rooms. Smoking inside the rooms can result in smokers being asked to leave the Hostel immediately with NO REFUND!!! If guests need cooking, ironing, using any high temperature devices and using any high power devices, please consult the reception first. 5. Only some of the rooms can add an extra bed. Please inform the reception if you need one. Whether or not the extra bed needs to be added, each room only can stay one more person (adult or baby). The person taller than 110 cm treats as an adult, who needs to be charged the extra bed rate. The person shorter than 90 cm is free to stay. The extra bed rate is the same with the dorm bed room fee. 6. The dorm bed (bunk beds) is only for individual. Unless you book a private room, there is no guarantee that you and your group will stay in same room. We will always try our best to put you together in the same room, but keep in mind this is a hostel and that's not always possible! 7. The dorm linens need to be return to the reception before checking out. And all the borrowed items need to be return to the reception too. 8. Maximum length of stay in the dorm room is 7 consecutive days. 9. There's a mandatory CNY 100.00 returnable deposit for each room key. Good hostel, the rooms are nice and I've got no complaints about the wifi. it's a little hard to find with the directions provided - it's on the street to the left of the big hotel that has a China post, then at the corner behind the kindergarten. Este texto foi traduzido usando Nós temos uma atmosfera única, natural aqui. A ponte, água, jardim ornamental em execução e Waterall fazer todo o hostel cheio de espírito. Eu realmente acho que a área comum é a fusão perfeita com a natureza. Você pode estar aqui, onde o sol é o seu novo vestuário, plantas verdes são os seus ornamentos e da piscina poderia ser seus sapatos de cristal. Se você quiser desfrutar de algum tempo quieto e confortável no meio desta selva de concreto, o nosso lugar é a escolha ideal. Viver em nossa pousada, você pode fazer muito: no início da manhã, jogar Tai Chi na varanda. Ao meio-dia, desfrute de um delicioso prato de arroz frito no nosso café. Na parte da tarde, desfrute de uma chávena de café delicioso lentamente no quintal. À noite, você pode ser bebido com um violão e uma caixa de cerveja até a manhã seguinte. Aposto que você nunca desfrutou de uma pousada bem assim!